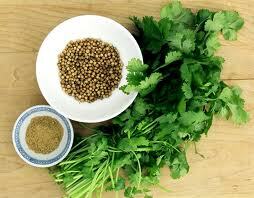 Coriander is very useful for health, it is commonly used in Asian Foods. All parts of the coriander plant are edible, but the fresh leaves and the dried seeds are commonly used in cooking. Seeds can be roasted or heated on a dry pan briefly before grinding to enhance and alter the aroma. The leaves of coriander are stimulant and tonic. increase secretion and discharge of urine. Coriander juice is highly beneficial in deficiencies of vitamin A, B1, B2, C and iron. One or two teaspoons of coriander juice, added to fresh buttermilk, is highly beneficial in treating digestive disorders such as indigestion, nausea, dysentery, hepatitis and ulcerative colitis. It is also helpful in typhoid fever. it is a good diuretic and stimulates the kidney. It can be prepared by boiling dry seeds of coriander and straining the decoction after cooling.